The Japanese novel To the Ends of the Earth and Sea – the story of Mongolian leader Genghis Khan – recently saw two different adaptations. The first was an epic live-action film in 2007. A co-production between Japan and Mongolia, the Genghis Khan movie won over the critics thanks to its lavish Mongolian locations and its battle scenes involving thousands of actors. The movie went on to top Asian box office charts and saw a limited theatrical run in America before being recently released on DVD and Blu-Ray by our good friends at FUNimation. Around the same time, Japanese publisher Flex Comics created its own manga adaptation of the novel and published the single-volume release in 2008. Thanks to Flex’s partnership with DC Comics and its CMX Manga imprint, the comic has been translated into English and is now available in the US to go along with the movie. This story explores the early life of the future leader of the Mongolian Empire back when he was only known as Temujin. He encounters Jamuqa, a boy from a rival tribe. After saving each other from the attack of wild animals, the two form a bond between them as “blood brothers.” But as the two grow older, they must battle each other for tribal dominance and the glory of being the sole leader of the Mongolian empire. With such a story revolving around one of the greatest conquerors in human history, you would expect the comic to an epic tale of blood, pride, and victory, right? Unfortunately, this manga adaptation of Khan fails to capture any of the awesomeness of its real-life hero… or of the movie, for that matter. Right at the start of this one-volume story, the comic challenges the reader by providing a nonlinear narration into the life of Khan. With in the first chapter, you see the entire exchange between Temujin and Jamuqa, them vowing eternal friendship, and then a sudden cut to the two of them battling each other as adults. A similar parallel happens at the start of the next chapter. The story constantly bounces between these two time frames, and it’s done in an attempt to show how the events of Temujin’s childhood affect the way his rules as Genghis Khan in his adulthood. I’m all for nonlinear storytelling, and in fact, I welcome it in most comics. But this constant jump in the narration becomes almost impossible to follow due to the inability to tell one character apart from the other. 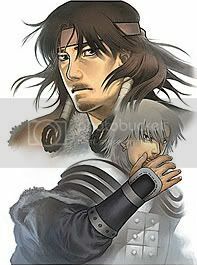 Many characters are introduced to the reader within the first half of the story, particularly with the many siblings of Temujin and then (in another symbolic parallel) his many children once he reaches adulthood. They each get their one line and word bubble description, but then very little else is offered to distinguish them after that. No one has any memorable name and the artist draws them with almost identical physical characteristics. Not that it really matters, because most of these characters are disregarded within a few pages. In fact, only a few characters actually play a key role in the whole story. Why did we have to dive so deep into Khan’s family tree when they never really mattered beyond their introduction? How the hell am I supposed to tell the difference between adult Genghis in the present and his father in the past when the two look so much alike? How am I supposed to care about the death of a character when I’m not even sure which one he is? All these factors lead to a comic that is too confusing to comprehend and enjoy. While the latter half of the volume stabilizes the time frame, this reader was already too lost to make heads or tails of anything. I had to read through the story a number of times just to get some kind of baring on it. When the editorial afterwords makes more sense than the comic it’s describing, than you know that something is seriously wrong with it. There is an underlying story of loyalty between Genghis and his “blood brother”, and the few moments that showcase this relationship’s evolution do actually make this comic resemble something worth reading. But besides for that, there isn’t enough tension, battles, blood, or glory to even pass this story off as being a decent adventure tale. This is Genghis-freaking-Khan here! Where’s the action?!? The Good: Single volume release tells the whole story in one sitting. There is also the occasional good scene involving Khan’s relationship with others. The Bad: Narrative jumps all over the place and is very hard to follow, particularly in the first half of the volume. Too many characters who lack the characteristics for the reader to distinguish from one another, which makes it hard to care for them. The comic, in general, lacks any “epic awesomeness” you’d expect from a story about Genghis Khan. Final Verdict: This manga adaptation To the Ends of the Earth and Sea falls flat from start to finish. If you want to see the epic story of Genghis Khan, you are better off renting the movie on DVD. This entry was posted on Wednesday, May 13th, 2009 at 9:02 am by Scott	.